When enterprise software is directly compared to consumer software, the UX of consumer applications wins. 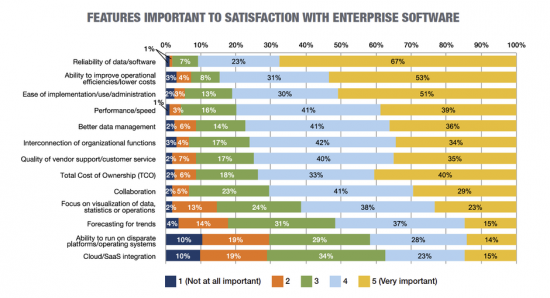 Find out in this new report what the enterprise is looking for in software, and why it matters. Within companies, software is used to perform a range of tasks from financial tracking and calculations to big data assessment, handling staff-related operations and messaging. It’s the glue that holds an organization together. About a third of respondents (34%) felt that the enterprise software user experience was better than that of consumer software. A higher number (44%) stated it was either somewhat or significantly worse. Approximately one quarter (23 percent) felt it was the same. This is a serious problem, with 90% of companies reporting that they use enterprise software, a 21% increase from Tech Pro Research’s previous survey on the subject. Enterprise software is ubiquitous among organizations, but it is mired in confusing menus, tedious workflows and unhelpful output. Meanwhile, consumer software is constantly becoming more intuitive and easier to use. This is clearly a product with frequent updates and revisions, since 69% of respondents have deployed new enterprise software in the past 12 months. And the majority of respondents, at 62%, have used the new deployment to replace an existing system. New business functions were implemented by 38% of respondents, demonstrating the frequent evolution of enterprise software. The reliability of data and software, as well as the ability to improve operational efficiencies, lower costs and the ease of implementation and administration were the features which provided the most satisfaction among respondents. The interconnection of organizational functions, performance/speed and better data management were also important. Conversely, Cloud/SAAS integration, the ability to run on disparate platforms/operating systems, and forecasting trends were not seen as significant factors for satisfaction. The report shows overall that enterprise software is continually evolving, and new deployments are common. But the user experience isn’t as pleasant as that of consumer applications. Read more about what it will take to increase satisfaction levels with enterprise software by downloading the full report, Research: The evolution of enterprise software UX.